At the beginning of the lesson, I always take the time to explain to my classes what “The Greatest Generation” means. I will recap that here. “The Greatest Generation” is a phrase coined by Tom Brokaw in his book of the same title. 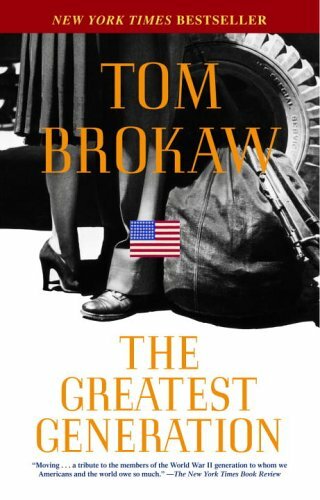 In his book, Brokaw uses the phrase to describe those who lived through the economic deprivation of the Great Depression and then went on to fight in World War II, overseas and on the home-front. After explaining this, we discuss as a class why might that particular generation be considered the greatest. I play on their collective knowledge of the World War II when I ask this question. The responses are fairly predictable with a few exceptions. At the end of the lesson, I returned to the question of the “Greatest Generation.” Throughout the unit we focused on numerous aspects often overlooked when buying into that narrative. Things such as racial conflict at home and abroad, labor unrest, and a booming black market (material goods in short supply due to the wartime rations could often be found on this black market). Finally, while concluding our discussion, we focus on the soldiers themselves. I usually explain to the class the destructive nature of World War II and how Americans on the home-front were generally naive about that. Granted, most Americans received their news through feel good pieces and hero tours that promote war bonds and included slogans like “Slap the Jap!” In that narrative, we lose sight of the emotional struggle veterans undertook as they coped with the reality of war. Americans really love nostalgia. We’re such a “young” nation, that you’d think we would be incapable of as much nostalgia and collective ADD at the same time. I’d have to agree with your student; the one that argued for the middle. Each generation, whatever that means — if you’re a poor 17 year old farm working Latina today, do you really count yourself in the same “generation” as Kendall Jenner? — has something to offer in the “end,” whatever that means too. I think we spend too much time re-living, rejoicing, and re-telling the past in ways that don’t open up into a dialogue of criticism, of lessons. We make kids recite speeches made by old men…under very (similar)different circumstances, but we don’t always encourage people to think outside the box…to write their own damn speeches. I think we spend a lot of time riding the coat-tails of old men…and then Selma’s 50th anniversary comes around, you realize how little and how much we’ve accomplished at the same time… how much we need the wisdom of the last generation. I agree with most of what you said. You guys are looking at this as an example of generations vs generations and society at large. We had a pretty good conversation about that very thing in class. What my students did not understand however, is why that Greatest Generation view is counter productive when studying history. An interesting question to pose, and certainly discuss. We should also remember that the “Greatest Generation,” convinced of its own invincibility, had no trouble committing hundreds of thousands of young men to fight in Vietnam, believing that they could defeat Communism with the same effectiveness that they defeated Hitler and Tojo. But Vietnam was a different war, a poor cause, and a new environment. The “Greatest Generation” met hubris and nemesis, and sacrificed another generation instead. Somehow, I doubt that made it into Tom Brokaw’s book. Rob, I would agree with you there. But it made it into David Halberstam’s “Best and the Brightest,” though. I’ll have to put that into my Amazon cart. I don’t believe I’ve ever read it. He’s a superb journalist and writer…it’s a fascinating accusation from a guy who covered Vietnam from the inside and outside as to why the US failed there. Also check out “A Bright Shining Lie,” by Neil Sheehan, which discusses the corporate culture of the US Army that went off to Vietnam, which was filled with the triumphal mentality of World War II and regarded the world as mere grid squares in which the guys in olive drab would defeat the Communists just as Patton had defeated the Germans. I’ll be sure to look at that. Check out Marilyn Young’s ‘The Vietnam Wars: 1945-1990.’ It’s an outstanding historical work. We’re starting to get some serious history and historiography on Vietnam these days, now that there’s some distance and perspective. Before he died, McNamara admitted his decisions were wrong, and Jane Fonda has admitted that her posing with North Vietnamese AA gunners was wrong.